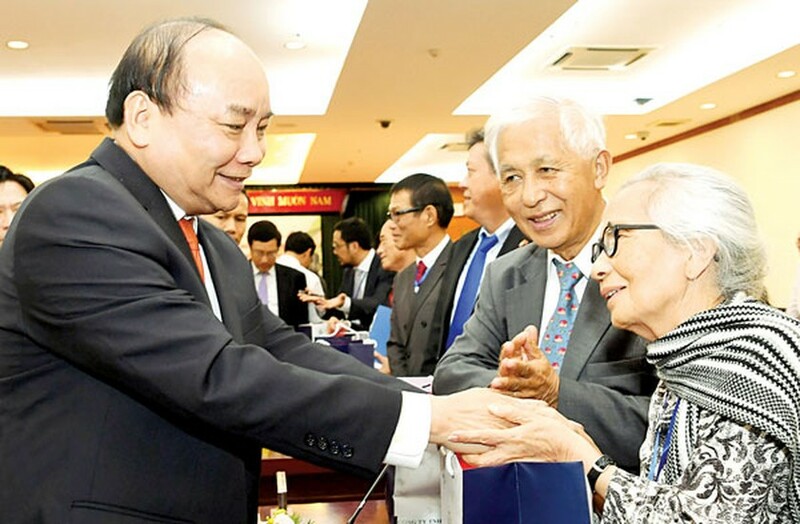 Over 500 overseas Vietnamese experts, intellectuals and businesspeople attended the third overseas Vietnamese conference in downtown HCMC last night when they presented many ideas, which Prime Minister Nguyen Xuan Phuc said very good and precious for the quick and sustainable development of the country and city. On behalf of the Government as well as the party and state leaders, Prime Minister Nguyen Xuan Phuc sent his hospitable compliments and best wishes to overseas Vietnamese in the world and at the conference. Directly listening to the event’s attendees, the PM expressed his emotion and acknowledgement to their practical opinions, ideas and solutions for problems of the country and HCMC. The presence of overseas Vietnamese at the conference affirmed that Vietnam’s development resources and potentials not only locate in the country but also in many other places in the world, he said. Vietnam always welcomes their return with aspirations, thoughts and resources for the country’s development. Appreciating the opinions and estimating them to be valuable to develop Vietnam’s institutions, Mr. Phuc required the Ministry of Foreign Affairs and the HCMC People’s Committee to record and select good and feasible ones and propose the Government to materialize them. In addition, the ministry, HCMC and other cities and provinces across the country should focus on creating feasible and necessary conversation channels and forums for overseas Vietnamese to put forwards their proposals and give opinions. Local authorities must be open to the new ideas, have feedbacks and encourage overseas Vietnamese to continue contributions, the PM required. For his side, Mr. Phuc affirmed that the Government determines to comprehensively speed up reform and building the tectonic and incorruptible government of action for the country’s development; create a fair, advantageous and transparent environment for local and foreign businesses. Deputy Prime Minister and Minister of Foreign Affairs Pham Binh Minh affirmed that the community of overseas Vietnamese is an inseparable part of the Vietnamese nation. Their cooperation in science and technology, investment and trading has become an important resource of the country, he said. Vietnam does need overseas Vietnamese’ knowledge, experiences, brainpower and enthusiasm to develop, he affirmed. Besides the PM and deputy PM, the event was also attended by Head of the Central Public Relations Committee Truong Thi May and secretary of the HCMC Party Committee Dinh La Thang. Discussing human resources development, Dr. Tang Anh Minh, a Vietnamese national resident in France suggested a university education development strategy. Specifically, he proposed HCMC to invest in regional scale education establishments. To practice that, the city needs to have polices for universities to encourage lecturers to do scientific researches, reduce the ratio of lecturers by students and internationalize curriculums by teaching some subjects in English. The municipal authorities should consider establishing a university education development consultant board including four participants, comprising HCMC representatives who would implement solutions given by the board, overseas Vietnamese and domestic experts and businesses who have a thorough grasp of market demand in human resources, he said. Dr. Tran Hai Linh, overseas Vietnamese in South Korea, said that science and education polices should give prominences to applied scientific researches to create surplus value for development. According to Mr. Linh, giving autonomy to universities might be considered as one of effective solutions to build up education. Those schools unable to meet social and national demands will have to change or self-eliminate. Worrying about over 200,000 unemployed bachelors and masters, financial and banking expert Phan Nam told an education story in Switzerland as a suggestion for local education model. Work-study is the core value of the model which will be applied to parts of students of age 16 and older. They will go to school two days and go to work three days a week to earn financial funding for their schooling. Afterwards they will college and graduate with available jobs. Sharing the same view, Mr. Tran Duc Canh from the U.S. approved the study-work method for high school students. At a meeting with outstanding overseas Vietnamese late afternoon on the same day, Prime Minister Nguyen Xuan Phuc said that Vietnam needed to be ware of limitations and problems especially in socioeconomic management and institutions. The awareness aims to make the country have stronger solutions not to balk. The more difficult it is, the more united Vietnamese people will be and the stronger their will is to develop the country, he added.